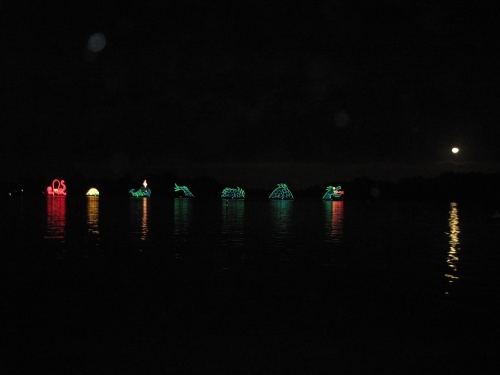 Jump into the Pacific Northwest at the Disney World Wilderness Lodge. 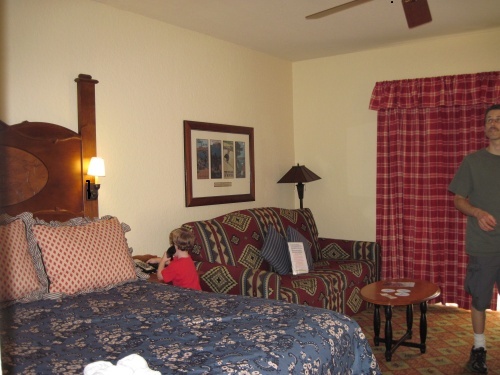 Though among the smallest of the deluxe Disney resorts, the hotel rooms are warm and inviting. Your needs will be met at this awe-inspiring resort! Disney Wilderness Lodge has 728 rustic rooms in the U-shaped building. The rooms blend luxury with rustic charm. The decor has a bit of western, rustic cowboy flourish. 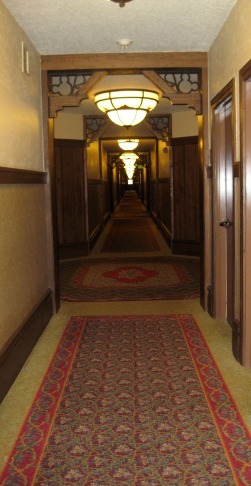 Rooms are decorated in red and blue with log furniture. Most rooms have two queen beds or one king. Queen bed rooms with a set of bunk beds is also available. Rooms also have an armoire and small table with chairs. At 340 square feet, the rooms are the smallest of the deluxe resorts, except the Animal Kingdom Lodge which has the same sized rooms. Rooms sleep four people plus an infant in a crib. Connecting and handicapped accessible rooms are available. 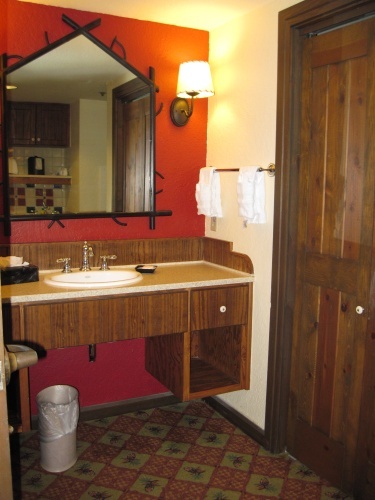 The vanity area with the sinks is separate from the bathroom. Most rooms have balconies or patios. Views are standard (parking lot, roof, road), woods or courtyard. The woods views are the most peaceful. You cannot see the Magic Kingdom from the woods view rooms due to the trees. Courtyard views are the most expensive with a view of the pool, geyser, Bay Lake or toward the quiet pool at the adjacent Villas. Upper floors offer fantastic views of Bay Lake. Courtyard and lobby view rooms can be noisy. Portable cribs (pack n play) are available upon request. The rooms are all non-smoking. Designated smoking areas are available at every resort. Animal Kingdom Lodge and Wilderness Lodge are the cheapest deluxe Disney resorts. Rooms rates start at $319 per night. The hotel has junior suites, honeymoon suite, Yosemite Vice Presidential Suite and a Presidential Suite. Old Faithful Club Level is the concierge level at the Disney World Wilderness Lodge. Old Faithful Club is located on the seventh floor. Guests receive the personal attention of the concierge, nice bathrobes in the rooms, turn down service and an array of food throughout the day. Food service includes a continental breakfast, afternoon tea, desserts, cheese, wine, snacks and beverages. The club level is expensive- whether it is worth it or not depends on what you are looking for. Escape from reality in the tranquil woods at the Disney World Wilderness Lodge. 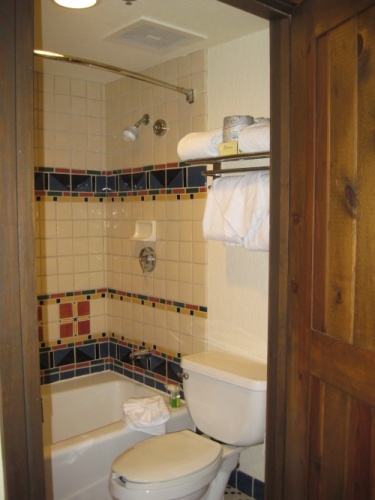 The rooms are quaint and cozy, offering all the amenities you would expect from a deluxe resort.